The Jackie Robinson Foundation provides a multi-faceted experience designed to not only address the financial needs of minority students who aspire to attend college, but also to guide them through the process of higher education, molding them into dynamic leaders. The award is given to outstanding high school graduates who plan to earn a baccalaureate degree from an accredited institution of higher education. Since its inception, the program has attracted the support of hundreds of companies, philanthropic institutions and individuals. As a result of JRF’s efforts, increasing numbers of students are able to attend the colleges and universities of their choice, where they are poised to develop their academic skills and leadership talents. A national, nonprofit organization staffed by 20 full-time employees and 90 volunteer professionals across eight geographic regions, JRF not only boasts a high graduation rate, but develops leaders who are prepared to compete effectively in the workforce of a global economy. With an average of 250 students enrolled in the program annually, JRF has had many years of success and experience with a diverse minority student population matriculating at 90 – 100 colleges and universities across the country, varying slightly from year to year. Over 1,450 professionals proudly call themselves JRF alumni, having been molded into dynamic leaders with a commitment to community service and the humanitarian ideals of Jackie Robinson. 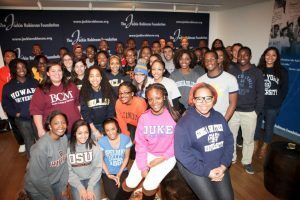 Uniquely, JRF provides generous four-year college scholarships in conjunction with a comprehensive set of skills and opportunities to disadvantaged students of color to ensure their success in college and to develop their leadership potential. JRF’s hands-on, four-year program includes peer and professional mentoring, internship placement, extensive leadership training, international travel and community service options, the conveyance of practical life skills, and a myriad of networking opportunities. JRF’s strategic combination of financial assistance and support services results consistently in a nearly 100% college graduation rate. JRF awards each student a $24,000/four-year scholarship to complement the financial aid the student receives from the college or university for tuition and other education expenses (books, housing, etc.). Advisory committee members, corporate sponsors, community leaders, and JRF alumni and staff serve as mentors. Each Scholar is assigned a mentor to enhance their developmental experience. Mentors assist them with a wide variety of needs such as academic guidance, career planning and internship placement. Corporate partners provide and assist Scholars with summer internship placement and permanent employment, offering valuable career development opportunities. The JRF staff works diligently with both sponsors and Scholars to identify appropriate internships and to secure summer and semester positions. Further, JRF Scholars also benefit from ongoing career counseling and assistance with locating full-time positions upon graduation. The Foundation provides workshops during the annual Scholars’ Weekend which focus on enhancing leadership skills, including conflict management, business etiquette and public speaking, and secures internships to enhance Scholars’ leadership development. Further, JRF provides forums for Scholars to demonstrate these acquired skills as members of the JRF student advisory committee, interview subjects for national and local media, and ambassadors at public events. Established in 1973 by Rachel Robinson to perpetuate the memory of her husband, American sports and civil rights icon Jackie Robinson, The Jackie Robinson Foundation (JRF) is one of the nation’s oldest and most effective college scholarship programs supporting minority college and graduate school students throughout the United States. JRF’s two-pronged approach provides generous, four-year grants in conjunction with a comprehensive set of services that results in a nearly 100% graduation rate, more than twice the national average for African American college students. JRF’s year-round support includes hands-on mentoring, job placement, curriculum and career guidance, practical life skills, international travel opportunities, and leadership training. While in college, each JRF Scholar completes 42 units that comprise JRF’s proprietary mentoring curriculum and that provide strategies for success in college and in life. Over its first 42 years, JRF disbursed over $65 million in scholarship aid and direct program services to over 1,450 students who have attended 225 different colleges and universities across the country. Since each of the 200 JRF Scholars is required to perform community service on an ongoing basis, JRF impacts another 30,000 lives each year through its student constituents’ volunteer service. Jackie and Rachel Robinson serve as extraordinary examples of the courage required in challenging society to address the needs of marginalized communities and encourage equal opportunity. The sacrifices they made personally and the strategies they used, as they confronted the resistance to including all citizens in the American dream, instruct and encourage others to persevere and to see that great progress can be made by even a few people. Those who study the Robinson legacy know that Jackie and Rachel Robinson used their celebrity to speak out against injustice both before and after Robinson’s baseball career; that they performed numerous deeds to effect change, as active participants and fundraisers for the modern Civil Rights Movement and with Rachel’s establishing the Jackie Robinson Foundation within a year of her husband’s death; and that their individual work, courage and comportment indelibly impacted our social landscape. The Robinsons provide both inspiration and a blueprint for others and personify the importance and effectiveness of focusing on one’s own experience and expertise to make a difference. In addition, the Foundation is engaged in building the Jackie Robinson Museum in New York City to inspire and to educate visitors of all generations about Jackie Robinson’s courageous achievements both on and off the field, and to promote dialogue around important social issues that continue to plague our society. Expanding our mission and our public constituency through the creation of the Museum will bolster our efforts to close the achievement gap in higher education. We appreciate that the strong images that Jackie and Rachel Robinson evoked throughout our society can impact other social causes as well. JRF also works to instill the same sense of pride, commitment and passion in all employees that the leadership feels in working on behalf of Jackie Robinson’s rich legacy of promoting equal opportunity, higher education and humanitarianism. JRF takes pride in helping to close the unacceptable achievement gap in higher education. Through programs like JRF’s, young people receive resources and strategies to earn advanced degrees, to self-actualize and to unlock their leadership potential. JRF also imparts to its young constituents the importance of adopting a set of values, invoking those embodied in the life of Jackie Robinson, that lead to their becoming citizens of good will with the skill and inclination to better our communities. JRF has never existed in a vacuum. We are humbled to have a longstanding history with both the private and public sectors, having partnered with over 400 corporations and private foundations in fundraising, diversity initiatives, volunteer opportunities for executives and other professionals, special events and marketing ventures. JRF also enjoys partnerships with over a dozen colleges and universities around our research efforts and to improve higher education performance models. One example of our successful, robust partnerships is that of our annual four-day Mentoring and Leadership Conference for JRF Scholars, graduate fellows and alumni, where we bring in dozens of corporate executives and industry leaders to speak with, teach, mentor our students, and to help build a vast network on which all of our constituents can draw. JRF offers many year-round opportunities for alumni to engage and reconnect. From job opportunities with the Foundation and its sponsors to serving on our 100-person strong, national Scholar Advisory Committees and JRF’s board of directors, JRF embraces those who have an in-depth knowledge of our mission based on their direct relationship from which they have personally benefitted. It speaks volumes when our alumni insist on coming back and getting involved with our current JRF Scholars. We’re humbled and thrilled each time a JRF alumnus reaches back and shares his/her time, resources, and strategies to help propel the Foundation. In fact, our current board chairman, Gregg Gonsalves, is a JRF alumnus himself. We must promote the importance of collectively tackling some of our nation’s biggest challenges. Government cannot do it alone. 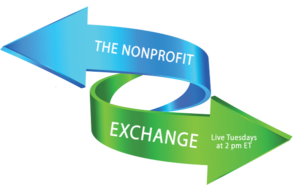 Nonprofits cannot do it alone. The corporate sector cannot do it alone. The most vital organizations recognize that, while an organization can have exceptional results, its reach can be greatly extended with like-minded partners who share the vision and goals. By increasing the depth of our secondary team, we can reach extraordinary heights. JRF’s holistic focus on the needs of our Scholars also creates a model that ensures success. By remaining flexible and in constant touch with our constituents over a period of years, we not only provide assistance better tailored to the needs of the students, but we are better able to identify the services and formulae that work best, allowing us to improve our model to benefit future constituents and to inform others working in our space. Our Scholars are masters at maximizing their time and, even at an early age, have shown great leadership and a commitment to others in need. Year after year, we meet incredible young people who manage school, extra-curricular activities, family life, and community involvement, excelling in each and expunging the perception that young people of disadvantaged communities do not add value. JRF Scholars serve as remarkable ambassadors of Jackie’s legacy, insisting on finding ways to impact local and global communities, associating proudly with the Robinson Family legacy of service. And many may not think about JRF’s impact from the standpoint of our corporate partners; we offer a pipeline of talented, well-prepared, diverse professionals who, upon graduating, add great value to the global workforce. We are committed also to adjusting our program model to meet the needs of contemporary college students. We seek to stay on top of technological advances and trends that affect our constituents. These measures have proven to be important elements of our consistent, very high graduation rate and the success our alumni realize. JRF’s two-pronged model that includes financial aid in tandem with comprehensive program support increases both the graduation rate and the likelihood of realizing our student constituents’ full potential and, thus, helps to close the achievement gap for minority students in higher education. Our data proves conclusively that academic performance and success in life improve with strong mentorship and social support. Beyond our four-year college program, we offer longer-term support for select students through our Extra Innings Fellowship that provides graduate school assistance. Our Jackie Robinson Foundation Alumni Association works to provide additional mentoring and support after graduation and is a viable network well into the future. JRF faces demands to address other aspects of our namesake’s legacy, which may generate attention and even revenue, but which could compromise our focus on our core services. We work to maintain the discipline to resist pressure to expand beyond our adopted mission and goals, even where we stand to drive additional revenue, knowing that ultimately meeting our own programmatic goals ensures sustainability. Our experience in higher education has instructed us that there are no easy or quick solutions to addressing the disparities in education and that an ongoing, holistic approach brings the best, measureable results. Della Britton Baeza has been President and CEO of the Jackie Robinson Foundation (www.jackierobinson.org) since 2004. During Della’s tenure, JRF has more than doubled the number of young people served, added graduate school fellowships and a work/study abroad component, upgraded technological capabilities, relocated its headquarters, opened a west coast office, and the Jackie Robinson Museum is planned to open in 2019.